Congratulations to the 4 women’s winners: OKSANA GRISHINA Fitness International, LATORYA WATTS Figure International, INDIA PAULINO Bikini International and in Women’s Physique International it was AUTUMN SWANSEN. 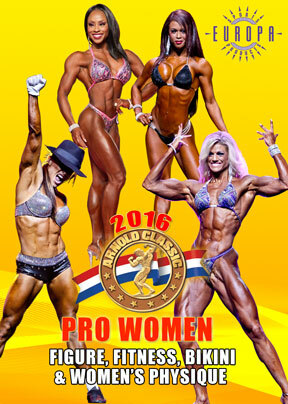 This wonderful competition is presented in a DVD of more than 3 HOURS, presenting the complete Prejudging and Finals of the Arnold Classic Pro Women’s Events – FIGURE, FITNESS, BIKINI and WOMEN’S PHYSIQUE. Plus all awards and Arnold’s interviews and presentations to the winners. The 28th Arnold Classic was held in Columbus, Ohio on March 3-6, 2016 at the Greater Columbus Convention Center and the Battelle Grand Ballroom. The Presenting Sponsor was Europa Sports Products. Congratulations to the 4 women’s winners: OKSANA GRISHINA Fitness International, LATORYA WATTS Figure International, INDIA PAULINO Bikini International and in Women’s Physique International it was AUTUMN SWANSEN. This wonderful competition is presented in a DVD of more than 3 HOURS, presenting the complete Prejudging and Finals of the Arnold Classic Pro Women’s Events – FIGURE, FITNESS, BIKINI, and top 10 of the WOMEN’S PHYSIQUE. Plus all awards and Arnold’s interviews and presentations to the winners. In the Extra Scenes see the highlights of the Pole Championships Series won by Tara Meyer. This was a multiple camera shoot using the latest HD cameras.